Cooking is an art form. Combining the right ingredients at the right temperature for the right amount of time takes knowledge, skill and creativity. But in order to be successful in the kitchen you also need to have the proper tools. 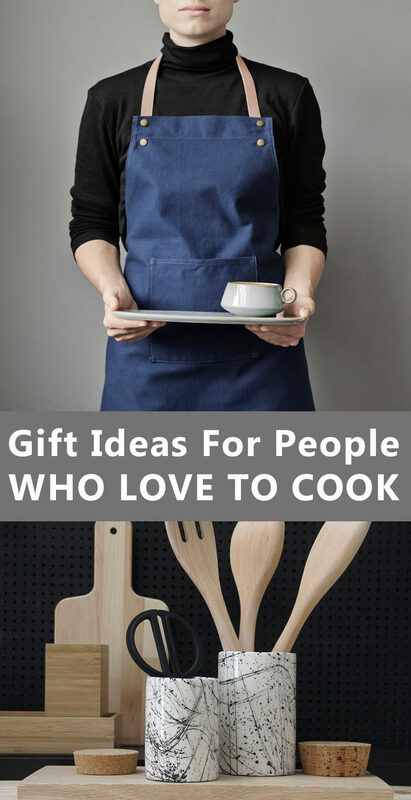 Today we’re sharing some gift ideas to help you find the perfect present for the chef or aspiring chef in your life. 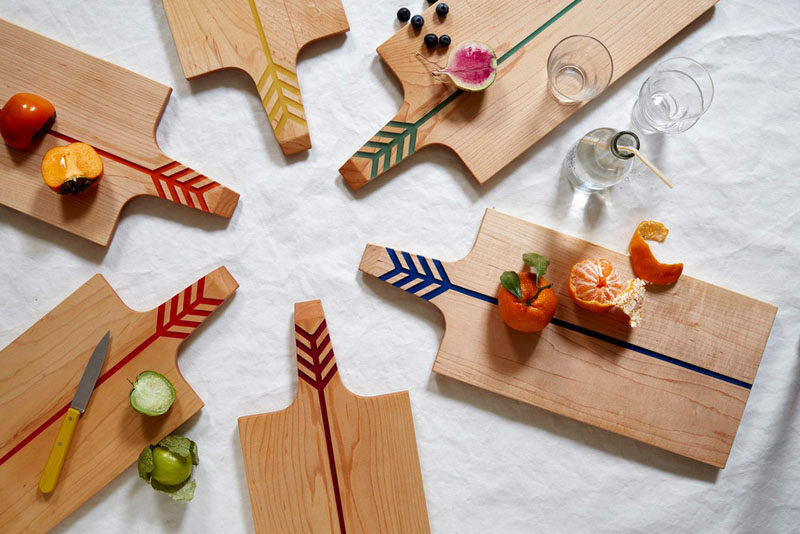 These cutting boards made from maple and colored resin can be used as either a solid cutting surface or a stylish food platter. 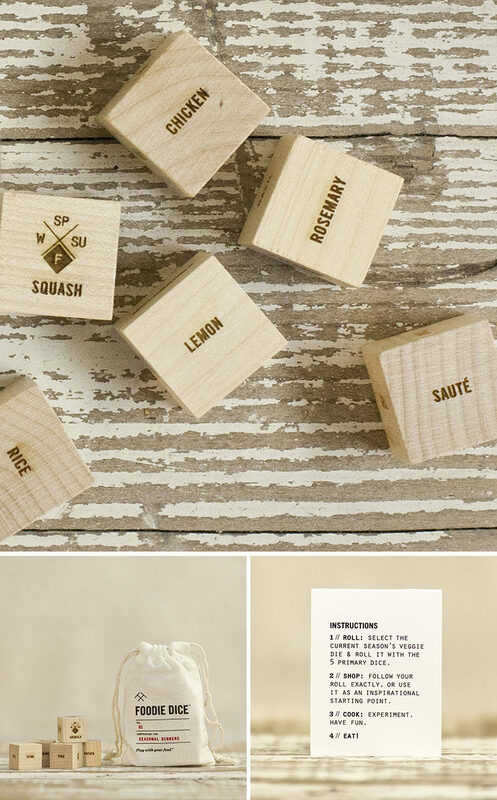 Foodie Dice are perfect for those who are looking for a little inspiration in the kitchen. After your roll, the dice will tell you what to make and how to make it. Quality knives are expensive. Keep them protected and preserved by storing them on a magnetic knife holder, like this one. 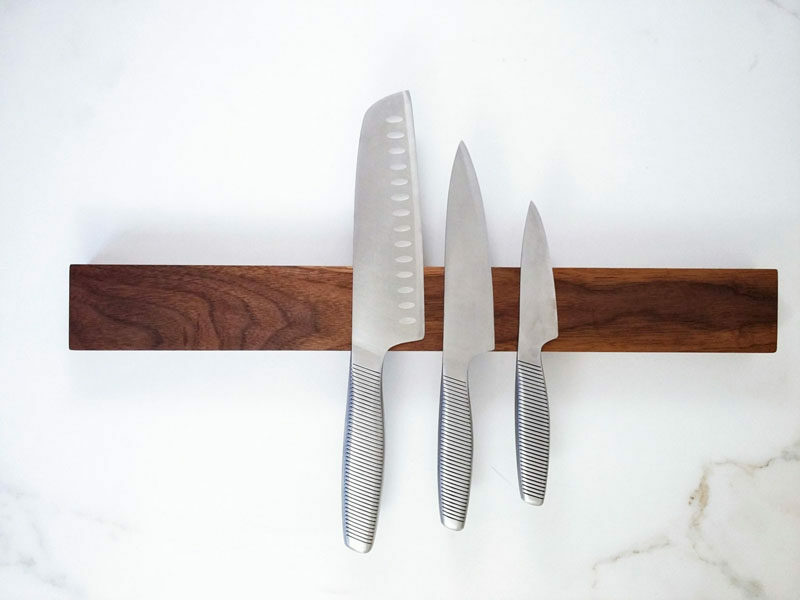 Magnetic knife holder by Wood all Good. Every chef has a lot of utensils. From flippers, to spoons, to spatulas and tongs, a utensil container keeps them out of the drawers and right within reach. 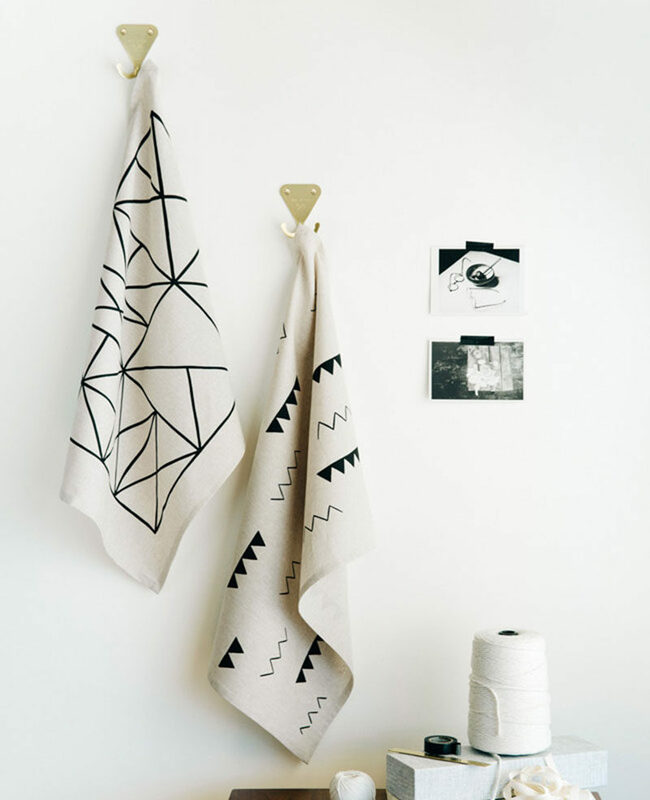 Geometric and minimal tea towels fit into any modern kitchen and make it easy to wipe up spills and dry off hands. 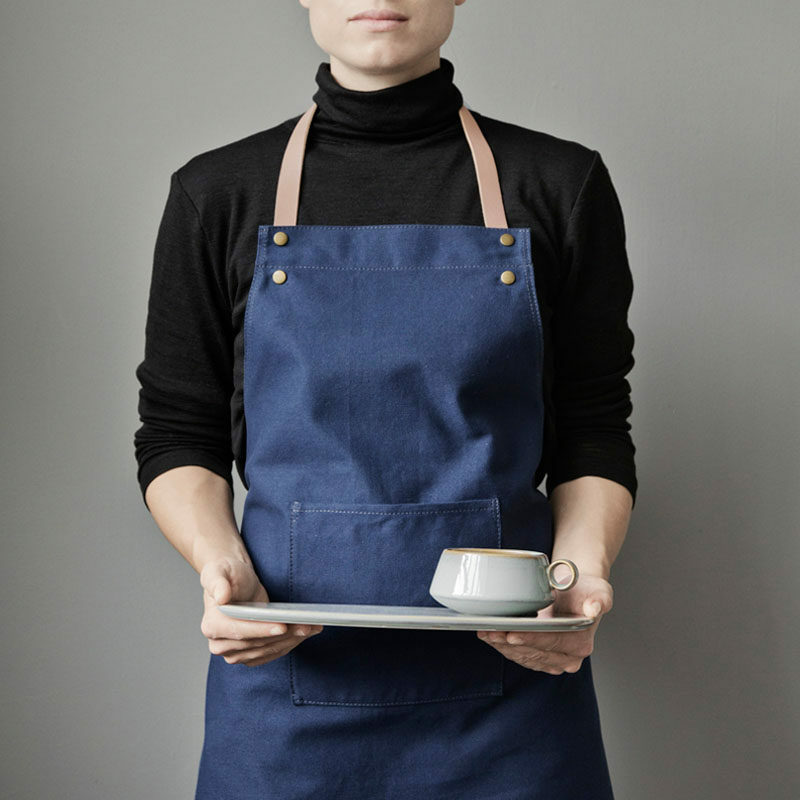 Linen Tea Towels from Cotton & Flax. With food flying this way and that, aprons are essential items to have on hand when preparing anything that might get away from you. 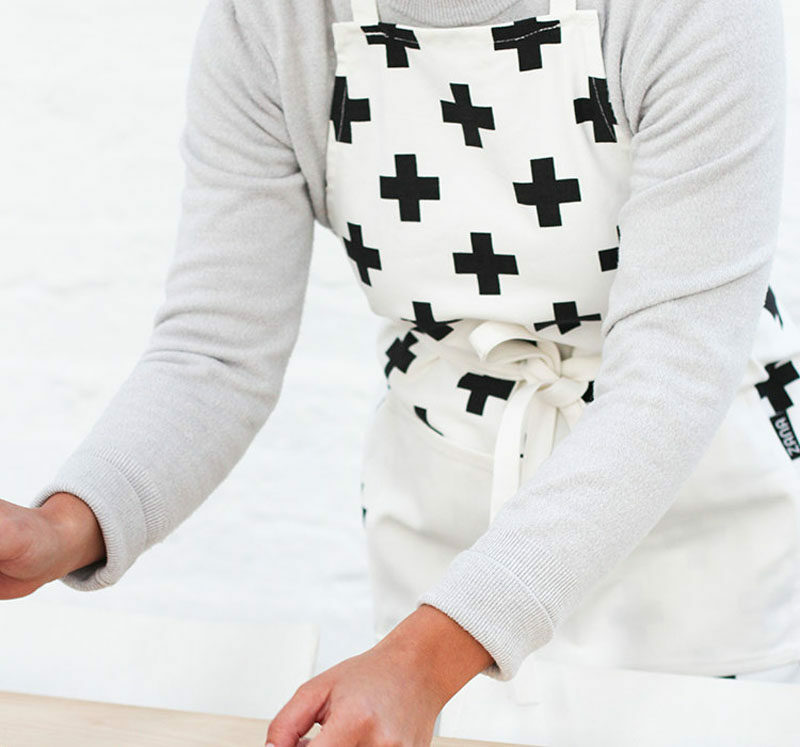 Swiss Cross Apron by Zana Products. 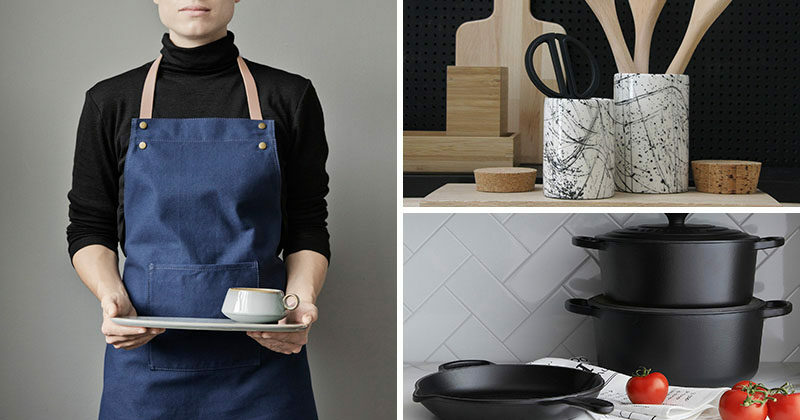 Blue apron from Ferm Living. 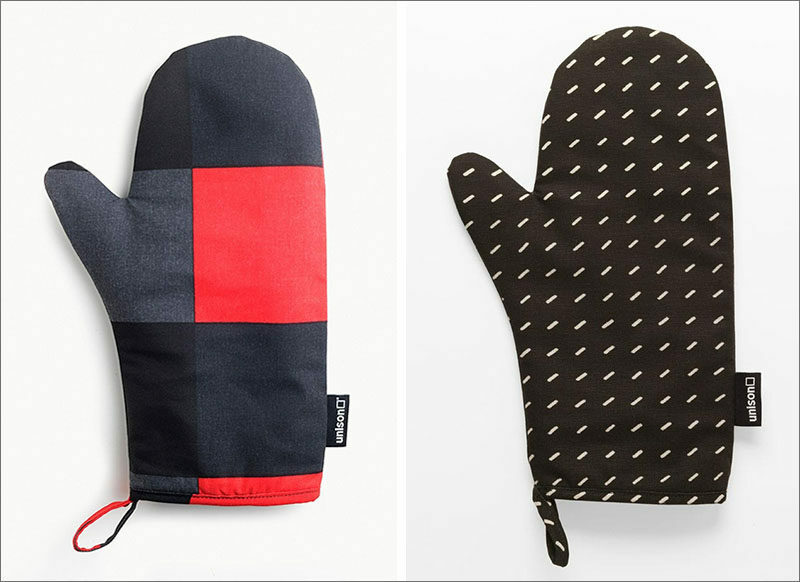 Oven mitts with color blocking or in a dark material hide food better than lighter colors and add style to your kitchen when they’re left sitting on the counter. 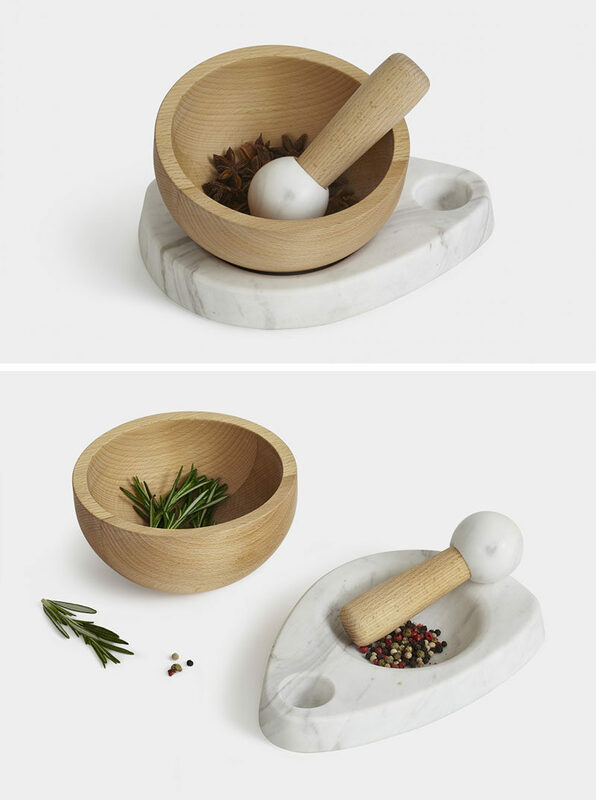 This mortar and pestle can be used in a number of ways to get various degrees of coarseness with the wood bowl being ideal for soft grinding and the marble dish being better for crushing. Crux Mortar and Pestle designed by Castor for Umbra Shift. 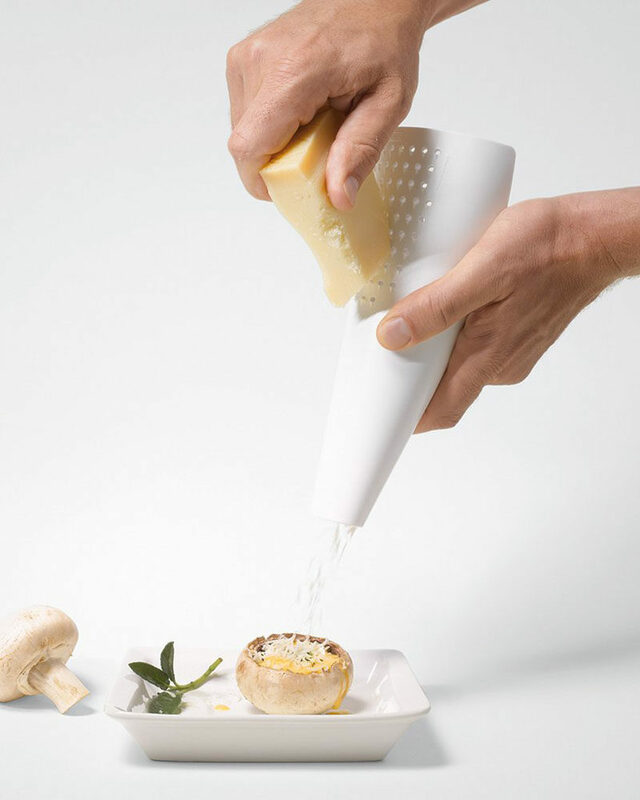 With two functional ends, this cheese grater lets you get just the right amount of cheese every time. The smaller end allows you to target the spot you want to cheese, and if you flip it the other way, the wider end lets you cover an entire plate with ease. 4Cheese Grater designed by Alejandro Ruiz. Available at AUTHENTICS. 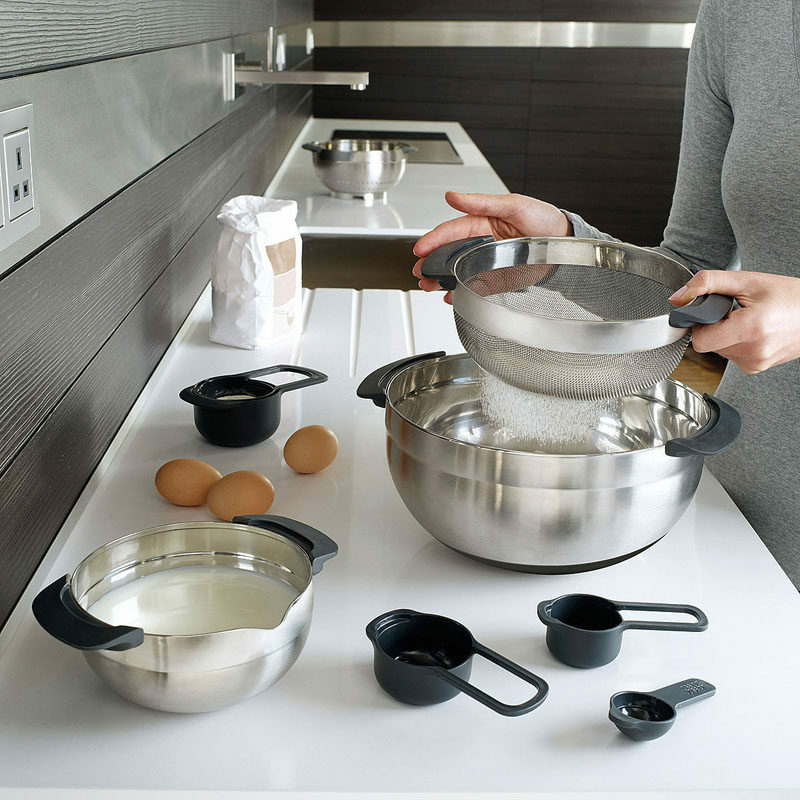 These bowls, colander, and measuring cups all stack on top of and inside of each other to make for convenient storage and to ensure that you have all of the essentials within reach. 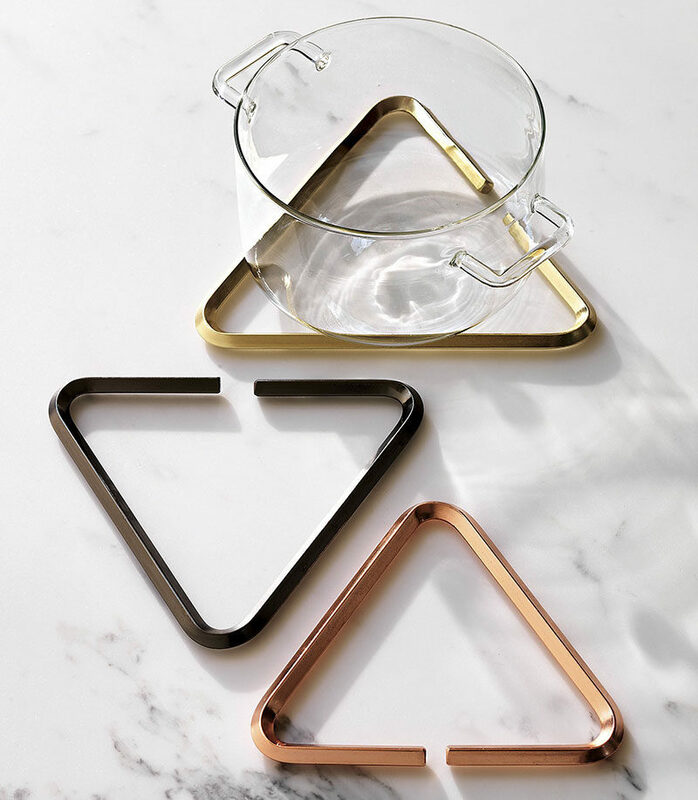 Stainless Steel Nesting Prep Bowls by Joseph Joseph. 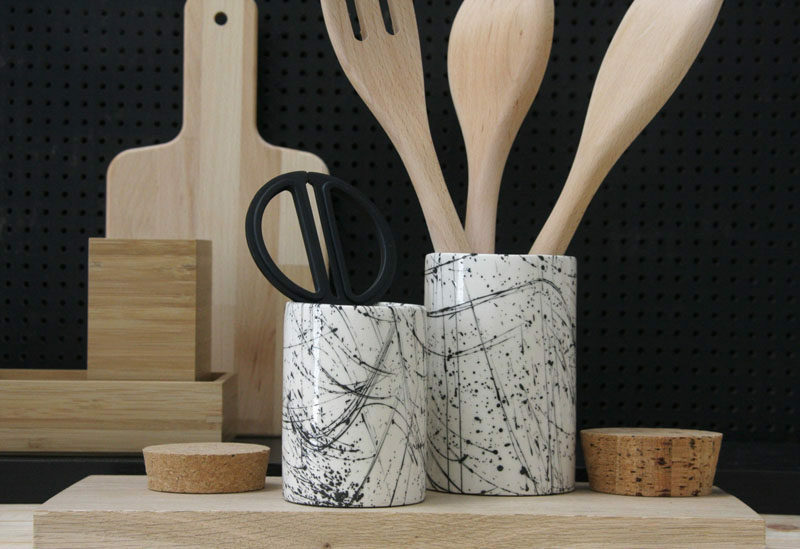 Flavor food in style with these modern and minimal salt and pepper shakers. 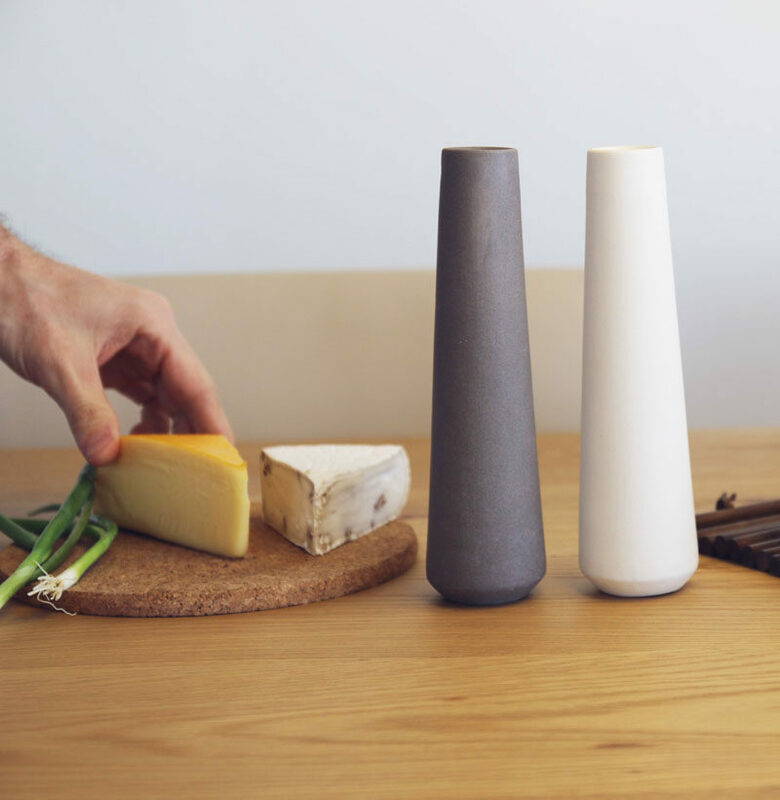 Modern salt and pepper shakers by Yahalomis. 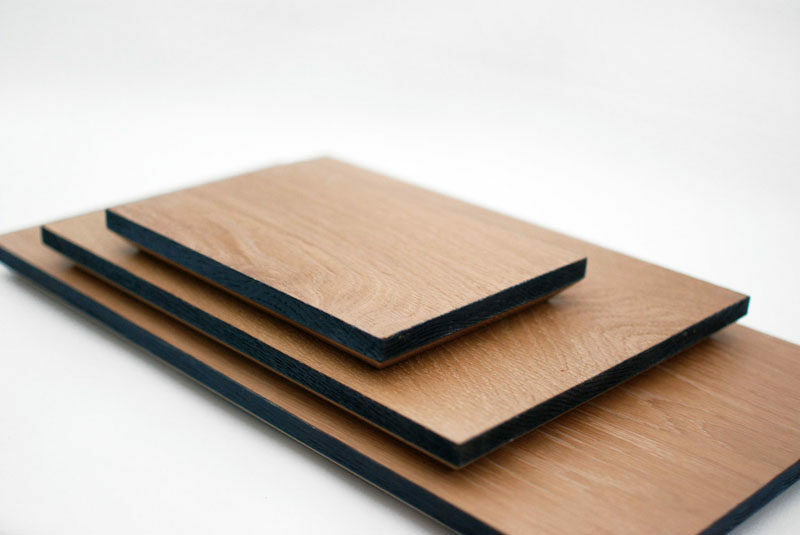 These oak cutting boards will protect the counter. 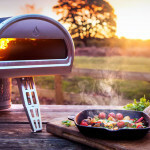 They have raised and scorched edges for extra style and easy pick up. Solid Oak Chopping Board by Heather Scott Designs. 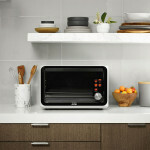 Hot pots, pans, kettles and plates can all be detrimental to countertops and tables. 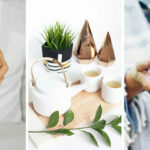 Protect your surfaces from extreme heat with these metallic triangular trivets.